He has read and understood these general terms and conditions. He is legally capable of hiring these services. He undertakes to fulfill all the above terms and conditions. He has the legal age to be responsible for his actions, such as the capacity to buy the products being offered. The former terms and conditions are mandatory. Once an order has been done, the client will have accepted all these terms and general sale conditions, after having read them all. 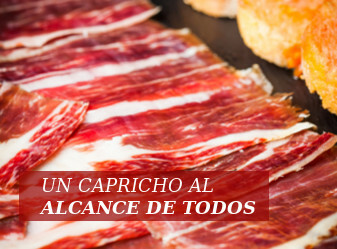 By accessing the web site www.gourmetdeibericos.com, the customer indicates his full and unreserved acceptance of these general terms and conditions. All the contents of the website, and in particular trade names, business names, industrial designs, designs, texts,photographs, graphics, logos, icons, software and any other signs that may be used in industry and business are protected by the industrial property and intellectual right of Gourmet de Ibéricos and the associated companies we are working with. Their use and/or reproduction or manipulation are therefore prohibited without the express consent of the company. The website and its contents will be only used by people as consumers of the products being offered. The user shall uphold the intellectual and industrial property rights of Gourmet de Ibéricos and/or third parties, and shall therefore refrain from reproducing, copying, distributing, making available or in any other manner publicly exhibiting, transforming or modifying the content, without the consent of the owner of those rights or where permitted by legislation. Access by the user to the content and services on the web site shall not under any circumstances imply any form of waiver, transfer or assignment of those rights in full or in part, nor confer any rights to use, change, distribute or publicly disclose the content or distinctive signs which constitute intellectual or individual property, without the previous express consent given for that purpose by Gourmet de Ibéricos or a third party right holder. Users shall only be entitled to view and to make copies of the content for their exclusive personal use, and must exercise those rights in accordance with good faith and the applicable legislation. A wrong or illegal use of protected materials will be responsibility of the user- customer. Gourmet de Ibéricos is a company that sells and distributes Iberian products obtained from Iberian pigs, olive oil, cheese and saffron. Gourmet de Ibéricos reserves the right of changing and updating contents of products, prices, offers and other conditions from their websitewww.gourmetdeibericos.com . The company makes sure that all data supplied by them are true and accurate, and there are no typing errors. If any mistake were found ,due to external causes, we would proceed to correct it immediately. 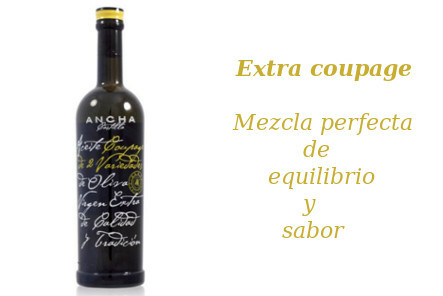 If a client would decide to buy any product affected by any mistake such as the above mentioned, www.gourmetdeibericos.comwill inform about this mistake immediately. Both parts will be able to cancel the contract without any additional cost if and when the mistake could be explained and justified and the customer agrees with the terms and conditions. The user/customer who wants to buy any product from our website must select it and afterwards click on the “Add to cart” button. Before doing this, the user will be able to read the description of the selected product by clicking on the product itself. Once the user has clicked on the “add to chart” button, he will have the option of going on buying products. If so, just click on the button “New item”. If the client has finished the order, he shall continue with the payment process by clicking on “Checkout”. Once the user has clicked on “Checkout”, the payment process will be started. A list of the client’s selected products will be shown on the screen. If the client wanted to go on buying products, he would click on “New item” again. If not, he would click on “ Registration” to continue with the process. Once the user has clicked on “Registration”, this process will be started. This is the former step needed to complete the payment. The user/client will be able to create a new client account using his email address (in the case of new clients) by selecting “create new account” . If the client has already had a client account, he will write his email address and his password, and click on “Register”. Once the user has clicked on “Register”, the process of confirming delivery and billing address will be started. The user will be able to select, change, cancel or add delivery and billing addresses. The user can have as many addresses as he prefers, but he will have to choose only one delivery and billing address to finish the process of the order. Once the user has provides both addresses (delivery and billing ones), he will proceed to go on with the purchase process by clicking on “ Payment” . Once the user has clicked on “Payment” , the process of selection and confirmation of delivery service will be started. If there are more than one delivery company available for that service, it will be communicated to the client so that he will be able to choose the one that adapts better to his interests. If there is only one company available, it will be confirmed to the client. Before continuing with the process, the client must read and accept the terms and conditions of the service. After having agreed with the general terms and conditions and subscribe them firmly by marking the appropriate box, the process of purchase will continue. After having read all these terms and conditions, the user will select the button “Finish payment”. Once the user has clicked on “Finish payment”, the process of selecting the payment methods will be started. There are different methods to proceed with the payment. The client can choose to pay through bank transfer, Paypal or Credit Card. Once the client has chosen how to pay, he will press the key “Confirm purchase” to finish the process. Once the client has clicked on “Confirm purchase”, that means that the final process of buying products has been completed. The confirmation of the detailed order will be displayed. 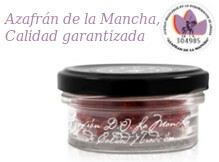 Gourmet de Ibéricos will proceed to prepare the order after having confirmed its payment. The client will receive a number of his order in case of any future complaint. Finally, the client will receive an email with all the information related his order ( number of the order, detailed list of the chosen products, delivery terms and information about delivery expenses). This way, the client will have all the information needed in case of failure or complaint. All the prices of products and services are expressed in Euros and include the corresponding VAT. They could be modified depending on the tax system of the receiver’s country. Gourmet de Ibéricos reserves the right to make modifications without previous notice. However, we commit ourselves to apply the prices shown in our web page when the purchase was done. The former conditions are only applicable to: Peninsular Spain, Balearic Islands, Peninsular Portugal and Euro Zone. For other destinations, please contact us via mail info@gourmetdeibericos.com or call us : +34 617 070 443 or +34 918 157 290. Those orders done from Monday to Friday before 14:00 pm, will be prepared to be sent during the same day of the purchase. Those orders done from Monday to Friday after 14:00 pm, will be prepared the following day of the purchase. Those orders done during the weekend (from Friday 14:00 pm ahead) will be prepared from the following Monday. Those orders done in a bank holiday, will be prepared during the first working day. The orders will be prepared after the verification of the payment. Place where your order was prepared. Final price of your order. Nowadays, GourmetdeIbericos has four places to prepare the customer’s orders and one driver available in each place. If your order consists on products from different places, the client will receive different deliveries, one from each preparation place. Furthermore, the delivery costs will be the sum of the total costs of each delivery. These details are clearly explained in the summary of the purchase process , one step before of the final purchase and payment. Regardless of the number of places your products come from, your order will be considered as one unique order in our shop. (*) This is only applicable to Peninsular Spain and Balearic Islands. The rest of the places will not have these benefits. If the total amount of the order is more than 180 €, the customer will not have to pay delivery costs. In this situation, Gourmet de Ibéricos will take charge of these expenses. The courier shall deliver the packet at the contact address provided by the customer in the order, within the days established for the product in its web-description or those established by the courier himself. 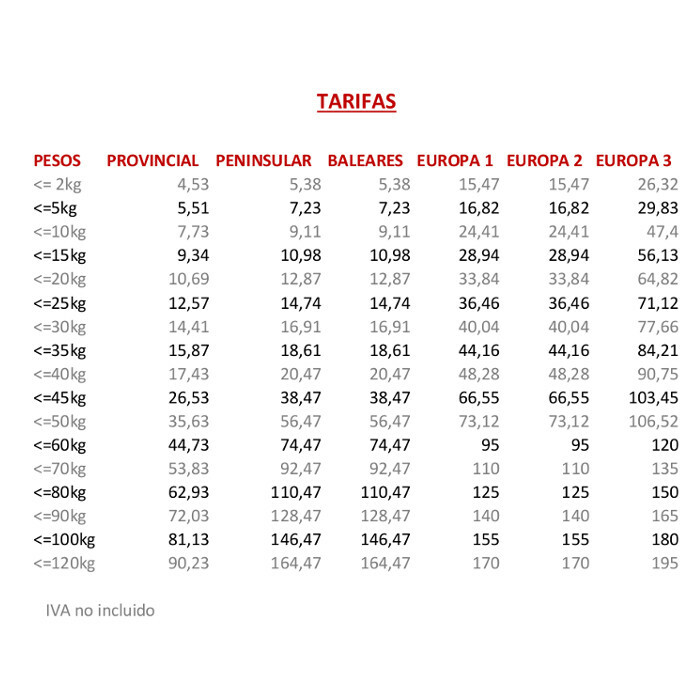 In both situations, the delivery days will vary from 2 to 4 days (Iberian Peninsula) or from 3 to 8 days for Euro Zone. Gourmetdeibericos won’t accept any responsibility if the delivery is unsuccessful due to a false address or wrong details given by the customer. This company won’t also have any responsibility if the delivery can’t be done due to the continuous absence of the client in the receiver’s address, after the delivery attempts established in your order conditions. Gourmetdeibericos won’t have any responsibility in delays due to reasons beyond the Company's control such as accidental situation or force majeure. Gourmetdeibericos works with Zeleris and MRW to deliver our products. It depends on the origin of the delivery zone. Delivery costs provided by Zeleris depending the weight of the goods and the place of delivery. Nowadays, we have deliveries throughout Peninsular Spain, Balearic Islands and Euro Zone: Germany, Italy, France, Portugal, Austria, Slovakia, Slovenia, Luxemburg, Lithuania, Latvia, Ireland, Estonia, Finland, Greece, The Netherlands, Belgium. 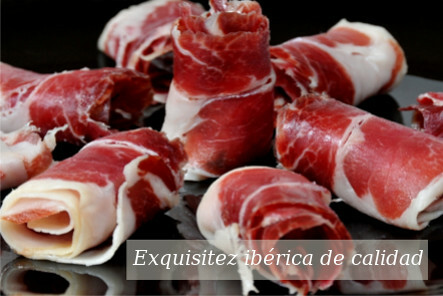 The customer/client who has bought products via www.gourmetdeibericos.com will have the right to cancel the order. To exercise this right, the customer/client must send an e-mail to info@gourmetdeibericos.com notifying this cancellation. He will have to write “Cancellation right” (“Derecho de Desistimiento”) in the subject and specify the identification number of the order. This notification must be done within 14 calendar days from the date of the reception of the product. In this case, the customer/client must deliver all the products in perfect conditions (not damaged, dirty or opened by the customer). If the products is not delivered in his original packaging, the product will produce a depreciation. After having checked the quality and perfect conditions of the delivered products, Gourmet de Ibéricos will give the cost of those products back, using the same payment method as the customer. If the client is not satisfied with the quality of the product and it doesn’t fulfill his expectations, he will have the right to ask for a change if and when he hasn’t consumed more than a 5% of the product. Gourmet de Ibéricos will receive that product and will send it to the experts who will decide whether the product is in perfect conditions or not. If the product has any failure, it will be replaced immediately, but if the experts consider that the product has the quality and taste expected, the company will send it back to the customer, who will have to pay the delivery costs. If any of the terms recorded in the general terms and conditions were found ineffective or invalid, it would only affect to those concrete terms, remaining the rest of the clauses active and relevant. In accordance with Organic Data Protection Law 15/1999 (hereinafter LOPD) and its implementing regulations, approved by Royal Decree 1720/2007 of 21 December (hereinafter RLOPD), Gourmet de Ibéricos hereby informs users of its Data Protection Policy, so that they can freely and voluntarily decide whether they wish to provide the personal data which may be required of them in connection with subscription or registration for any of the services offered. Save in the fields where indicated otherwise, replies to questions relating to personal data are voluntary. 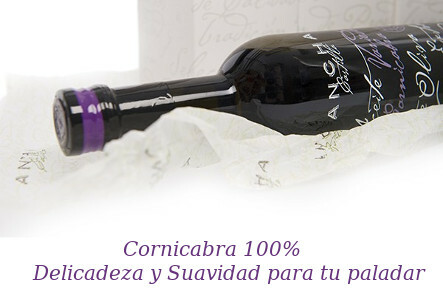 I.- All the personal data provided by the user/client through the website www.gourmetdeibericos.com will be gathered and processed in an automated personal information folder whose owner is Amparo Sánchez Molinillo, owner of Gourmet de Ibéricos. The purpose of the gathering and automated processing of the personal data is the management of services requested by the client and the sending of future useful information about products and new services available. 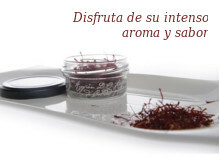 II.- The client accepts the use of his personal data by Gourmet de Ibéricos. This information will be exclusively used for the purposes above described. 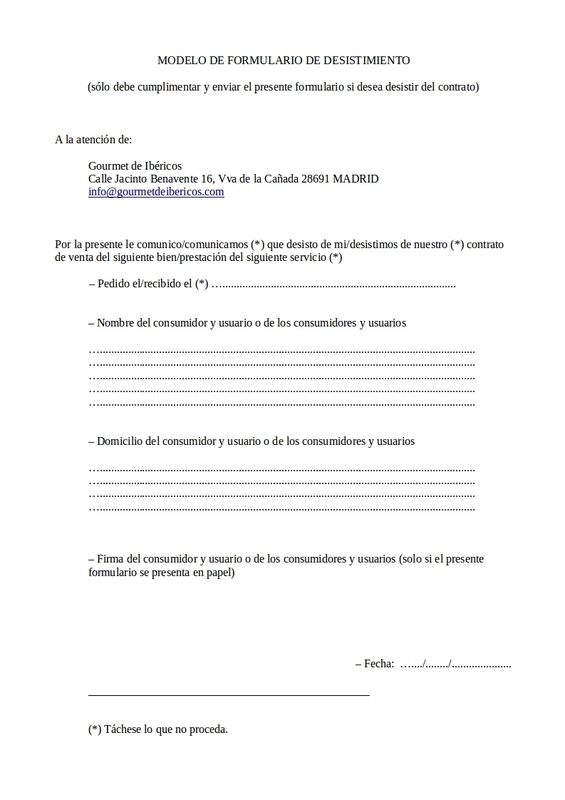 III.- To guarantee a correct sending of commercial information about services and products, the user must fill out all the data required in the website www.gourmetdeibericos.com . Otherwise, Gourmet de Ibéricos can’t guarantee this service. IV.- The personal data gathered by Gourmet de Ibéricos shall be processed secretly and confidentially. Gourmet de Ibéricos has adopted all the resources and technical measures available to prevent the loss, alteration and unauthorized access to the personal data provided in accordance with the Royal Decree 1720/2007 of 21 December (RLOPD). Users have by law and shall be entitled to exercise the rights of access, rectification, cancellation and opposition to the processing, use and transfer of their data. To do so, the user will have to write a lletter signed by the holder of the data if being older than 14 ( and with an acceptance of parents or legal tutor if being under 14) to the following address GOURMET DE IBÉRICOS: Amparo Sánchez Molinillo, c/Jacinto Benavente 16, 28691 Villanueva de la Cañada - Madrid, attatching a copy of his ID or via mail to info@gourmetdeibericos.com. attatching the same documents as in the previous situation. Finally, the user will be the only responsible of his registration data ( user name and password) so Gourmet de Ibéricos won’t be responsible of the loss, bad use or destruction due to the user’s negligence. When users browse through the website www.gourmetdeibericos.com, they may receive cookies on their computer sent from the server or, on our behalf, from servers of third party undertakings engaged by us to provide advertising and audience tracking services. The undertakings from which cookies are sent may not under any circumstances know users' personal data. Where users allow receipt of cookies, they can find out the server from which they were sent, by consulting the instructions for use of their browser. Gourmet de Ibéricos uses session cookies, analytics, Marketing, social networking sites and external components. All the facts at issue related to the web site, its general terms and conditions shall be governed by Spanish legislation. Disputes, conflicts and legal problems will be submited to the courts and tribunals of the city where the user/client lives.